Chrysoprase is the name of a fictional troll character in Terry Pratchett’s Discworld novels (not to be confused with the monstrous trolls of folklore and J.R.R. Tolkien), but for our purposes the word chrysoprase is a gemstone variety of chalcedony that contains small quantities of nickel. Its color is normally apple-green, but it can vary to deep green. The color is what makes it attractive to jewelers. An example is the Georg Jensen silver and green chrysoprase necklace shown here, a featured lot at John Moran Auctioneers’ May 23rd sale in Monrovia, Calif. 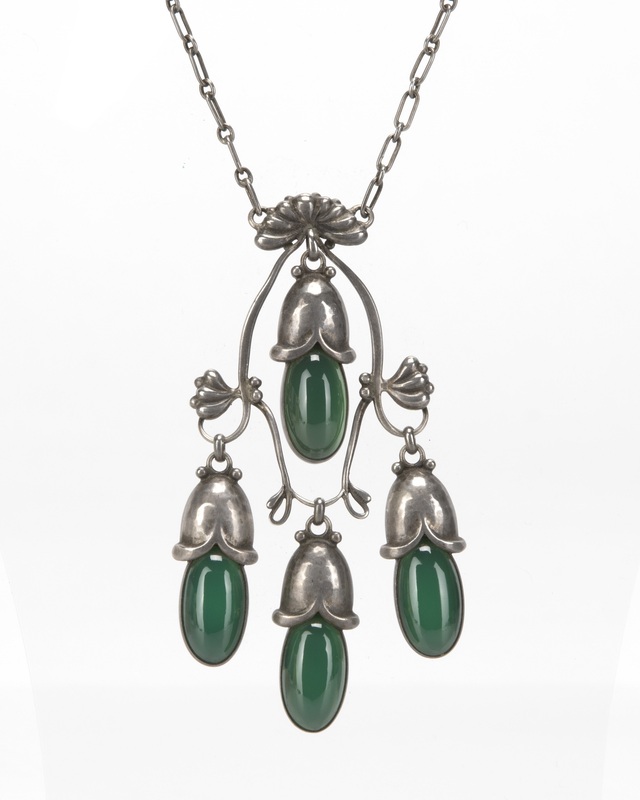 The necklace, which boasted the famous Georg Jensen “blossom” motif, had a pre-sale estimate of $1,000-$1,500, but multiple online, telephone and floor bidders pushed the final price up to $4,800. Unlike emerald, which owes its green color to the presence of chromium, the green in chrysoprase can be attributed to the trace amounts of nickel compounds in the form of very small inclusions. As with all forms of chalcedony, chrysoprase has a hardness of 6-7 on the Mohs hardness scale (vs. 7.5-8 for emerald), and a conchoidal fracture similar to that of flint.